If you want to render from your Write module, you will need to use the Render Network option found in the File menu. 1. Select File > Export > Render Network. The[Ctrl] + [Shift] + [Y] (Windows) or [⌘] + [Shift] + [Y] (Mac OS X). 2. In the Range section, select the frame range to render. 4. 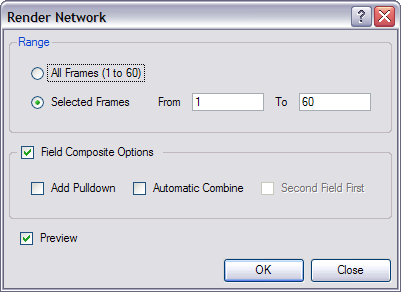 Select Field Composite if you want Animate Pro to render the final images as fields for display on interlaced monitors.